» Tell me… What states would you like to visit? Do you live in one of the places listed above? Tell me what’s to see in your town. 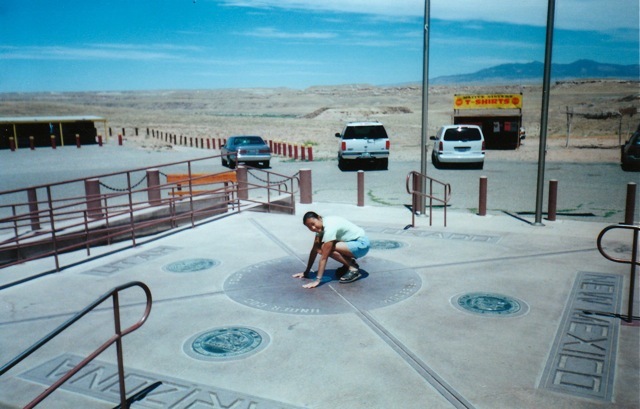 I’ve been to the four corners! I love road trips. I live about 3 hrs from Chicago. I’ve only been a handful of times but I’ve liked what I’ve seen. I want to take a road trip to: California, Maine, new York, and take my kids to all the places I’ve been. Come to Chicago! We have a great city and there is so much to do especially in the summer. We have the beach, Museum of Science and Industry, Planetarium, Chicago History Museum (which has an interactive kids section), Cubs games, tons of parks, every type of street festival you can imagine, and lots of other kid-friendly happenings! Such a fun place to live! I would like to visit Chicago and DC. I might have to come up with a list to post on my blog today- I love to travel. I would be happy doing a tour of the 50 states in a huge RV! I would also love to go to Chicago. I would also like to go to the Grand Canyon. I have been out west before and it is just beautiful!! I would definitely suggest a trip to D.C. My husband and I went before we had kids and did a lot of walking around and it was wonderful. I would love to go again with my kiddos, but maybe when they are a little older and can appreciate all the history. My kiddos are around the same age as yours. I would like to see NYC at least once. I would also like to go to Philly PA, and Alaska, and Seattle. Most of the places I would like to go to I have already been to: San Diego, D.C., Utah, and Hawaii! Are you looking for a place to visit with only bicycles and horses and no cars? Try Mackinac Island, Michigan and step back into the past. It’s only a 20-minute ferry ride away from the beautiful Mackinac Bridge that joins the two peninsulas. “Somewhere in Time” with Christopher Reeve and Jane Seymour was filmed there. The Lilac Festival in June has the biggest horse-drawn parade and the fudge is to die for! See Chicago on the way up! mackinac island sounds spectacular! i will have to add that to my list. I second Mackinac Island, along with the Leelanau Peninsula in Michigan as well! Also, I L-O-V-E Chicago!!!!! I want to visit every single US state at some point, which is quite tricky from Scotland! I’ve managed 10 so far though which is not bad going. I’m going to Denver later this year so that’ll be another new state for me. I’m not sure which ones are next on my list, I’ll just see what opportunities present themselves! I’ve lived in beautiful NH for 25 years now. If you like cold, snowy winters February is a good time to visit. Mud season March – May is rather ugly. Summer is fantastic, fall is colorful and winter is breathtaking. Spring is hit or miss – some years we don’t have a spring – just a long winter. Some NH sights that are worth the travel – the White Mountains up interstate 93 – Mt Washington, the Polar Caves and Loon Mountain, ski area by winter, hiking trails in the summer. Our seacoast is only 10 miles long, but is on the way to Maine and is beautiful with many family beaches. Maine is large and rustic AND beautiful! Have fun in NH! aww I want to go to Alaska so bad! You are the first person I know that says “I want to visit Alaska” but I mean drive there, not just fly there, the fun of it is going through aaaaaaaalll the states you have to go to get there, it would be so much fun. I have a friend who lives in Anchorage, and he told me so many things about Alaska, it made me want to go there even more….